I’ve been on the farm for just shy of two months now, and I can probably count the times I’ve been off the property on two hands. (Maybe three, if we’re including runs to Trader Joe’s to replenish our compost toilet wine cellar). I don’t have a car, but everyday life at Love Apple—working in the garden, swimming in the pool, eating groceries that magically appear at our apprentices’ cottage each Thursday—leaves little to desire. Another advantage to the self-contained lifestyle is that when you do get the chance to venture out, it’s a genuine thrill. Attending the roller derby bout in Santa Cruz last Saturday? I’ll admit it, I dressed up. And when, like yesterday, the field trip is spontaneous, it’s all the more exciting. 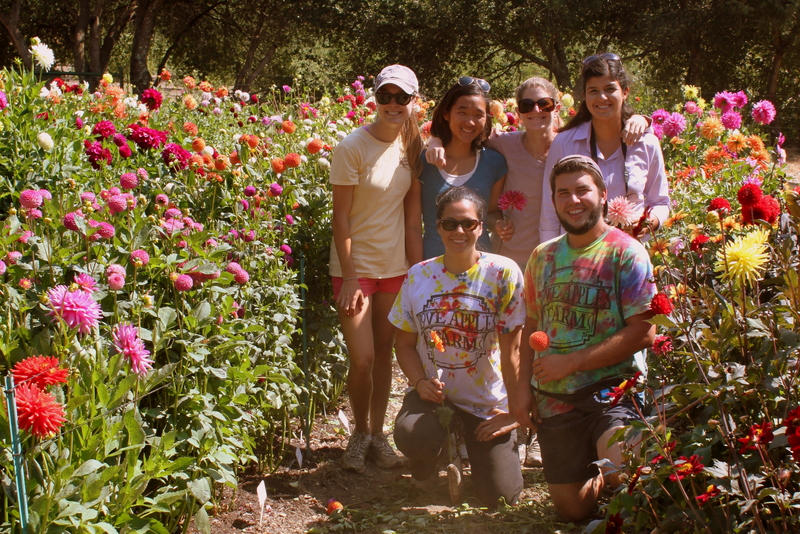 Especially when the destination is the Corralitos Gardens dahlia farm. 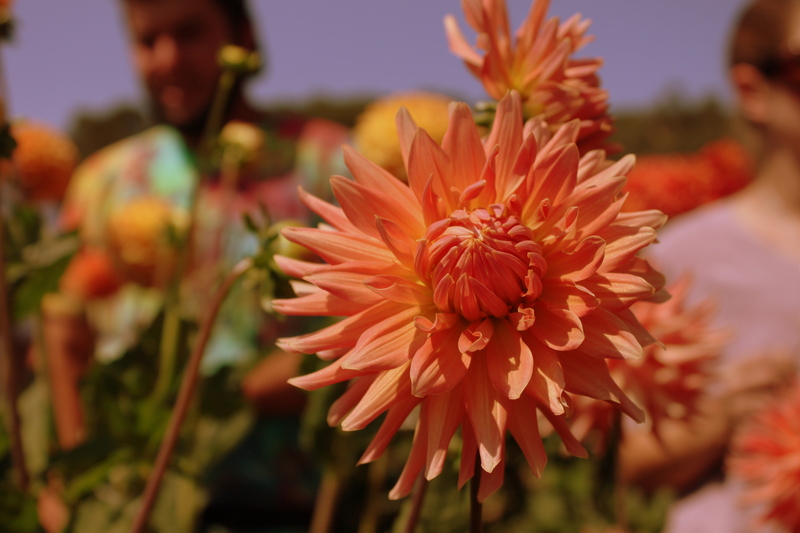 Cynthia is a longtime lover of dahlias, and my first week on the farm we planted them along the main driveway with Milly, a feisty gardener in her 70s who has been saving tubers for decades. 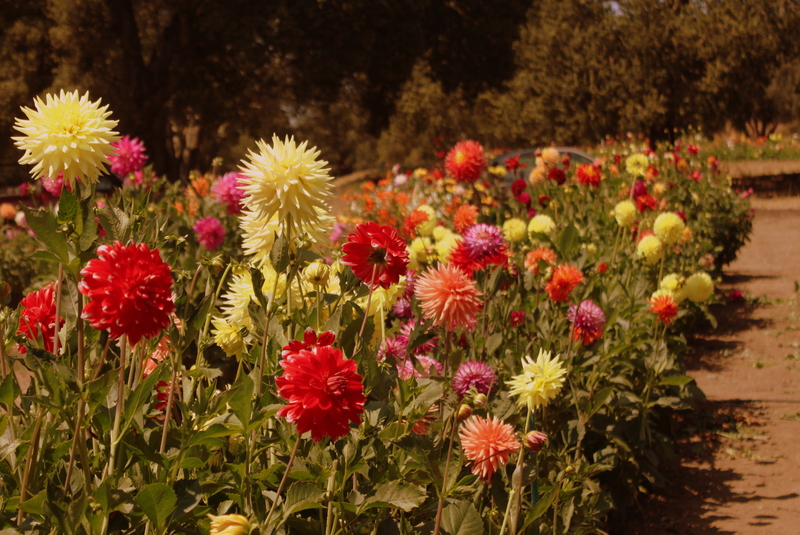 We have a few beautiful older specimens at Love Apple, but Corralitos Gardens was like stepping into one of Milly’s dahlia catalogs, where each flower seems to belong to a fantasy world. (With names like Carmen Bunky, Creekside Volcano, and Eden Barbarossa, how could they not?). Of course all good field trips end with food, and ours was no exception. On our way back to the farm, dahlia blooms in hand, Cynthia took us by Mi Pueblo, an enormous Mexican market that featured chicken feet (in the cart of the woman in front of us), Mamey (a melon with bright orange, honey-sweet flesh), and Arroz con Leche paletas (my two favorite desserts—rice pudding and ice cream—combined to glorious effect). Back at the cottage we toasted with tamarind soda as Lisette made tortillas in our brand new tortilla press, and while we cooked our protein (mysteriously labeled “Al Pastor meat”) we still managed to throw in some love from the garden, with a sauté of zucchini, fresh corn, and nopales. 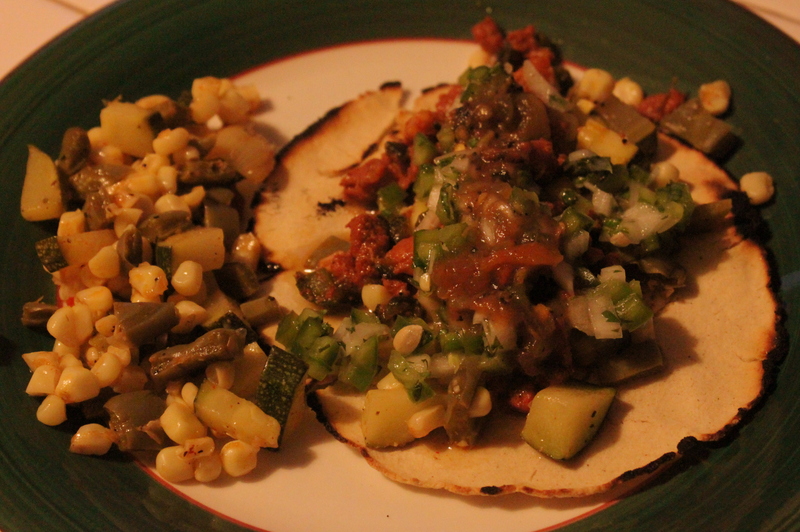 Nopales, the leaf-like pads of the prickly pear, add an element of the exotic to this veggie saute. Feel free to improvise with what you have–we have zucchini spilling out of every available large bowl in our kitchen, hence my recent slew of zucchini recipes. Boil the peeled nopales until tender, then set aside and cool before dicing into small pieces. Place the ears of corn in a 400 degree oven and grill, turning occasionally so all sides get nicely toasted. Meanwhile, in a large saucepan, saute the diced zucchini in olive oil, then add the pieces of nopales. Take your grilled corn and cut the kernels off the cob, adding them to the saute as well. Season with salt, pepper, and Cholula, tasting for spiciness, and finish with a handful of chopped cilantro. Millie will be flattered with your estimate of her age. She’ll be 91 this October. Next field trip, maybe we will go to her garden!